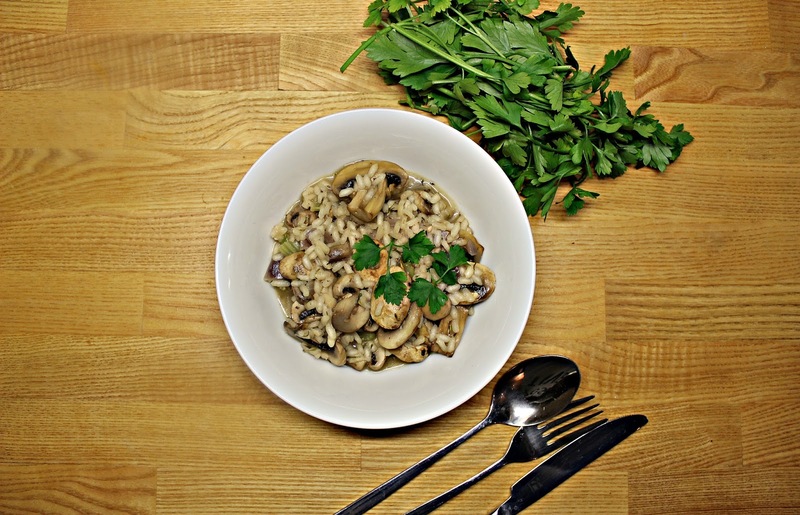 My vegan mushroom risotto is a perfect midweek dinner idea. Minimum ingredients but guaranteed maximum satisfaction, this dish is ready within 40 minutes and is very delicious, clean yet hearty. Chop the mushrooms and place them in a baking tray, sprinkle extra virgin olive oil salt pepper & dried thyme and pop these in the oven between 180-200 degree celsius. Next, chop the onion and celery sticks. Add a good glug of extra virgin olive oil in a pan and once thats hot throw in chopped onions and celery and let them cook for a few minutes. Then go on to add salt & pepper and continue to cook & sweat the onions for about 5 minutes or so. Then add 250 grams of arborio rice into the cooking pan and toast them for a couple of minutes. Get your stock ready so in about a litre of boiling water crumble two veg organic stock cubes. Once the rice has a tad bit colour on it, start adding stock to the pan ladle by ladle. Keep stirring and turning as you add each ladle. This will massage the starch out of your rice & make it creamy in consistency. About 25 minutes later or so, when the rice is almost cooked but still has a bite to it (i.e. slightly more than al dente) take the mushrooms out of the oven and tip them (mushrooms & the water from mushrooms) in to the pan. Keep massaging & turning with your ladle. Taste the rice, if its cooked, get it off the heat. When you serve risotto it must be slightly oozy and gooey, to get that if you need a bit more stock, add more stock to the rice.